Kate Gleason College of Engineering Dean Doreen Edwards accepted the 2018 Changing Hearts and Minds Award on behalf of her college at an event at Liberty Hill on Sept. 28. 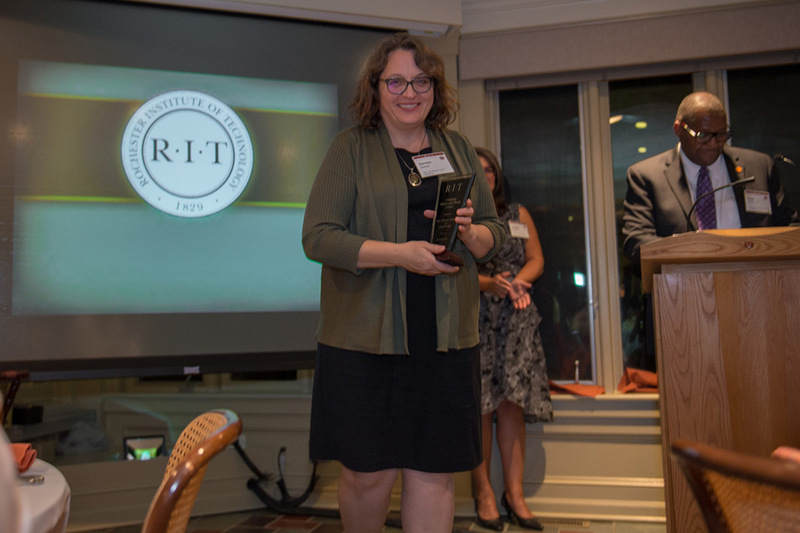 The Kate Gleason College of Engineering earned recognition for its efforts to enhance diversity among the faculty ranks and further Rochester Institute of Technology’s overall commitment to diversity. The college received RIT’s 2018 Changing Hearts and Minds Award, sponsored annually by RIT’s Office of the Provost and the Office of Faculty Recruitment. The award began 11 years ago to signify a college’s desire and ability to break through artificial barriers that prevent historically underrepresented faculty populations from gaining access and equity. It acknowledges their ability to move beyond regulatory compliance to develop, train, promote and model inclusive behavior by providing a welcoming environment. This year, 18 percent of the Kate Gleason College of Engineering’ faculty hires were from historically underrepresented populations. Dean Doreen Edwards accepted the award on behalf of Kate Gleason College of Engineering at an event at Liberty Hill as part of the Future Faculty Career Exploration Program. The award includes $2,500 in funding to further advance the College’s underrepresented minority faculty recruitment and retention initiatives. Past awardees have used the funds to send faculty to diversity-focused conferences, provide start-up packages for female faculty members and facilitate college diversity and inclusion events.